Our range of products include densi polished floor. 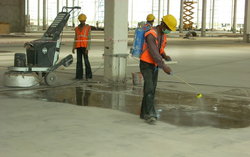 We are well-known entity involved in manufacturing and supplying supreme quality Densi Polished Floor. These polished floors are created on concrete floors with the assurance of enhanced strength. These high lustre floors are specially developed with densification technology with Nano Lithium Silicate which makes it robust and extremely durable. Further, the offered floors are finished with the sophisticated diamond polishing machine and can be ordered from us at a market leading price. Packaging Details: 5litr, 20litre bucket are available. Also 200litre drums are available.